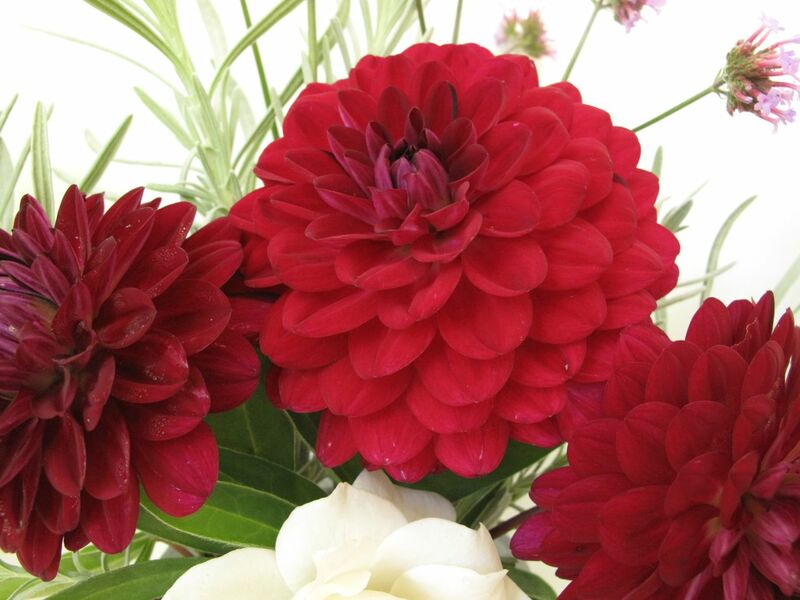 I love rich, dark red dahlias. This looks perfect with the white rose. Bluebell is actually purple isn’t it? Very nice but I think this is even nicer. Gorgeous in the marble vase. Hi Liz, I should stop referring to this dahlia as bluebell–it looked blue/purple on the box, but this one is definitely red. I’m just as pleased with the red. A shame you don’t know the name of the Dahlia, it is rather special, is it better than the one you ordered? The rose adds just the right note of contrast, White is a definite must have more of in the garden for me; it looks wonderful on its own and adds so much to the charm of other colours. 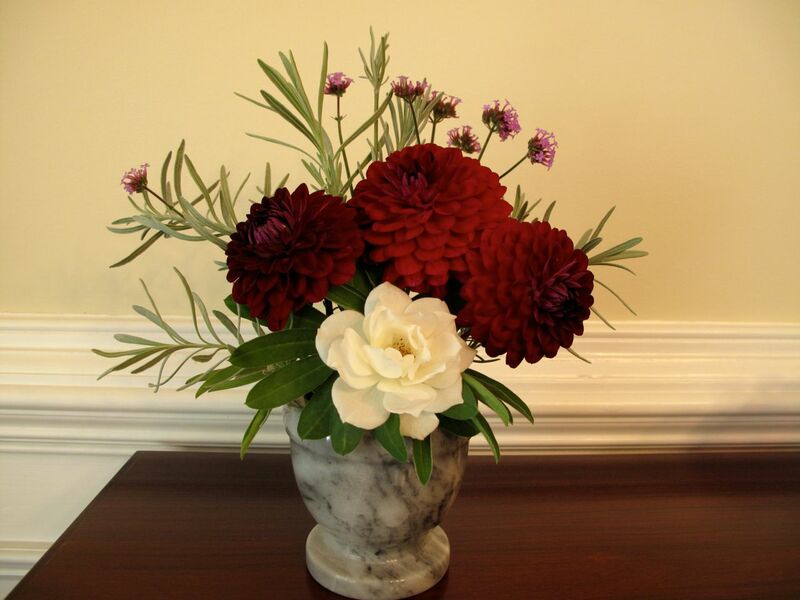 I like the chunky marble vase, as you say the Dahlias need a strong base. I don’t think I’ve ordered a dahlia, but did buy one locally in a gallon pot last week, marked down to $1.00. It’s also red and nameless. May be too late to grow much but it had one lovely flower and lots of buds. I was happy to see the rose bloom this fall; it failed miserably in spring. I have a similar dahlia that I had to cut as the cold set in…and I used a bit of white with it too in my vase…isn’t your vase wonderful. 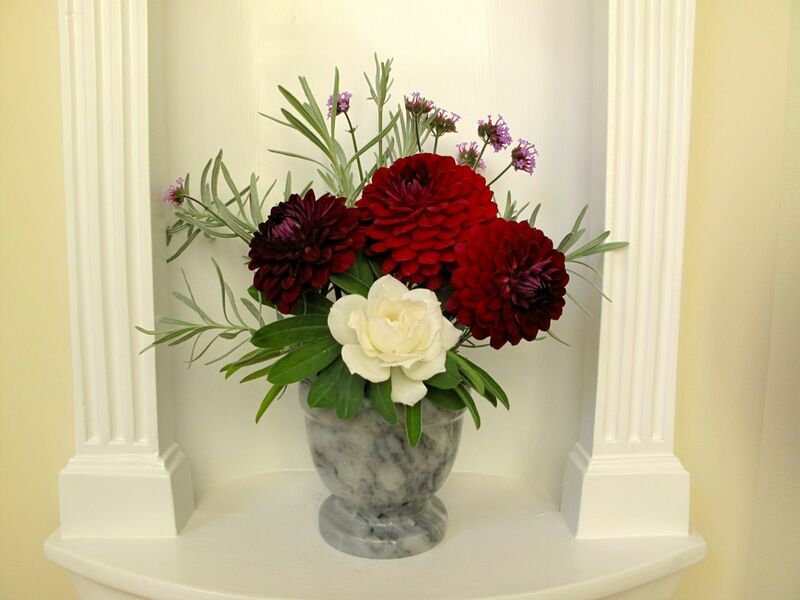 perfect to display the richness of the arrangement. Thanks Donna. White flowers are wonderful in the garden don’t you think? I keep thinking I’ll plan a moonlight garden but most of my garden dreams never get executed. It could happen though. I haven’t tried dahlias here, as I seek to avoid digging/keeping/replanting. With all the beautiful dahlias appearing In a Vase on Monday, perhaps I should reconsider. You could just treat the dahlia as an annual. Mine has been a real pleasure, but I doubt I’ll bother to dig this one up. I have overwintered one before that lasted for 4 or 5 years. I love Iceberg roses Susie, they have a wonderful purity and look perfect with your Dahlias. We had a big drop in temperature here too, its refreshing but I hope that it doesn’t drop much more just yet. This Iceberg once belonged to a dear friend who passed away, so I inherited it. Seeing it in bloom is a special treat. I agree about the temperature. The cool weather was a real wakeup call–seems too early for winter to be butting in, though I know it’s not. We usually have a frost around the 3rd week of Oct. The marble mortar is a great idea for a vase – and isn’t it strange how the vase looks very different when you compare the first and last pictures? I love to see your perfect flowers, and am so enjoying seeing all the vases that you and others fill from their own gardens. I really would be hard pushed to buy flowers these days – and probably haven’t since the meme started. How about you? Thank you so much for all your contributions, Susie. I used several different camera settings today and tried several locations. The lighting is always a challenge. I haven’t needed to buy flowers lately either. Creating a weekly arrangement makes me appreciate the ones I’m growing even more. What a perfect collection of blooms. They’re so solid and strong looking I’m glad you added the lavender and verbena sprigs. It’s a nice contrast to the heavy marble. Thanks so much. Glad you liked the lavender and verbena sprigs–sometimes it’s hard to know when to stop and whether something else is really needed. 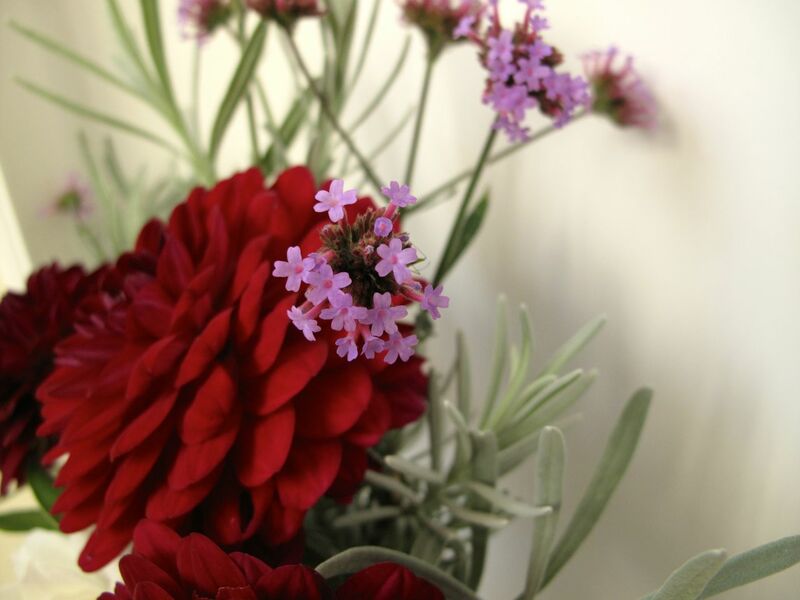 Those are really gorgeous dahlias, and I really like how the verbena’s wispiness contrasts with their solidity. Thanks. The dahlia has been a pleasant surprise this year and has me thinking about trying some others next summer. 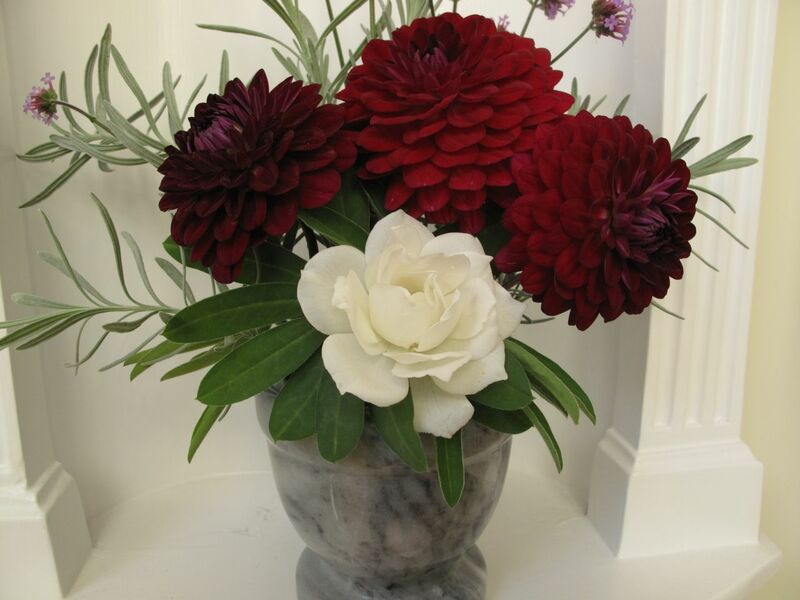 It can be hard to find a good vase for dahlias, the pom poms in particular need a vase with some oomph, your marble mortar works beautifully, as does the lupin foliage. Gorgeous rich colour to that dahlia, though why on earth anybody would describe it as blue has me beat! It’s a beautiful arrangement, Susie. The mortar provides a perfect vase. As soon as I saw it, I thought maybe I can appropriate the mortar my husband uses – I am short of vases, although I suspect that theft would put me in the doghouse. Thanks Kris. Best to stay out of the doghouse. Now you have me wondering if it would be ok to use the mortar for both purposes, although I can’t remember the last time I used it for anything. What a stunning combination…Typically I am not quite as formal, but I really appreciate how you pulled this together and the amazing outcome. The texture and colors are perfect. Thanks Charlie, the flowers were nice and fresh which helped the outcome. When cutting the flowers from the garden I was picturing something much more contemporary, but the design pulled more traditional. I noticed the lupin foliage immediately Susie and think it the perfect frame for your rose! 🙂 I also love the way the lavender echoes the vase colour. 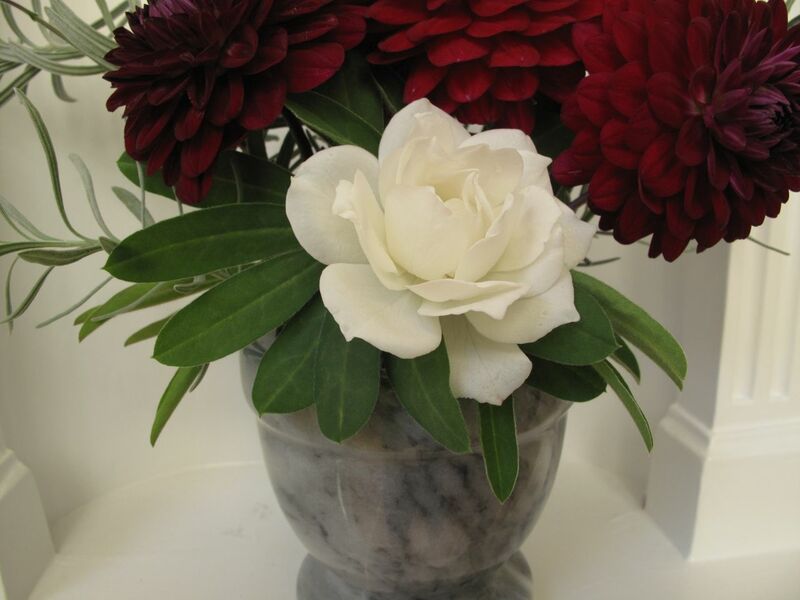 That vase is ideal for such sturdy flowers and the final effect is of strength and calm at the same time. Strength and calm–I like that Cathy. Thanks for the lupine suggestion. Don’t think I’d have noticed its potential. Have a nice week! Thanks! Judy, you could try treating the dahlia as an annual. I am probably going to leave this in the ground and hope for the best, but of course, your area is much colder. What a beautiful arrangement, Susie. 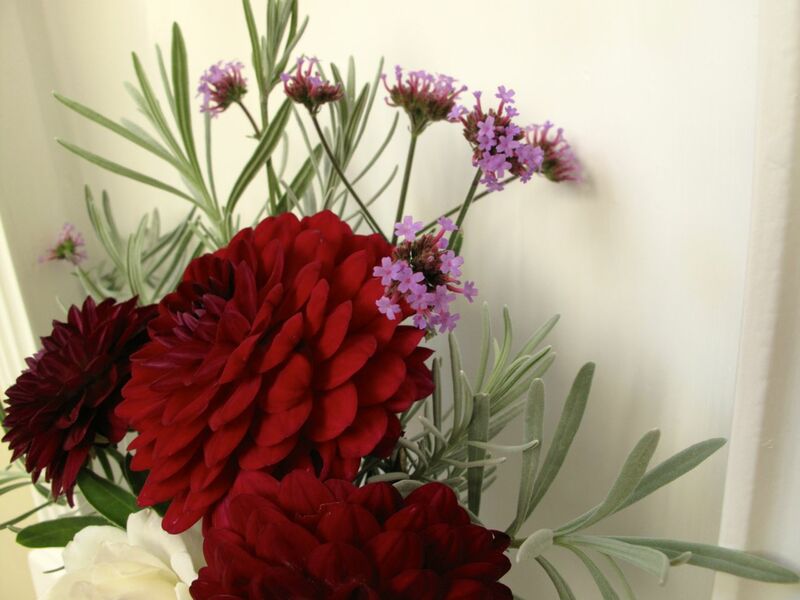 I love the burgundy dahlias and the placement of the lupin foliage is inspired. Pity ours got ruined in the storm this week but there’s always next year. Thanks Elizabeth. It’s a good thing we gardeners can always look to next year. I’m loving that red this autumn. Cut three more dahlias this morning. I’ve never thought of using a mortar as a vase; a very nifty idea. 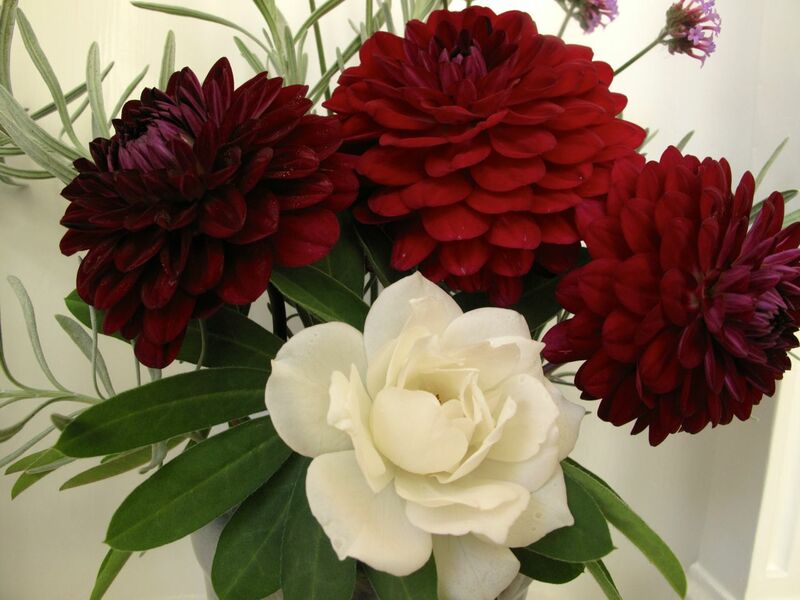 Love the contrast of the Iceberg and deep red dahlias. I used a glass jar insert to contain the flowers, so they weren’t directly in contact with the mortar itself. I don’t use the mortar for spices or anything else, but might want to someday. The red dahlias are still going strong, but the iceberg has had only three or four roses all year.